Butterfly bush ‘White Profusion’ is a popular variety of buddleja and is widely regarded as the best white buddleja cultivar. Introduced in 1945, the ‘White Profusion’ was awarded the Royal Horticultural Society’s Award of Garden Merit (AGM) in 1993 and was reaffirmed in 2010. This variety has become widely spread and loved by gardeners in both the United States and the UK. This butterfly bush is known as a large, vigorous shrub that is largely undemanding. ‘White Profusion’ is a deciduous plant that requires hard pruning in March and regular deadheading to ensure optimal flower growth. Concerning soil type, this butterfly bush is trouble free and can be planted in loam, chalk, sand or even clay. It will do best in moist, well drained soil in full to partial sun. ‘White Profusion’ is a low effort, high reward addition to any summer border! Due to its upright, bushy habit with flowers at the end of this year’s growth, it is also suited as a backdrop to other flowering plants. 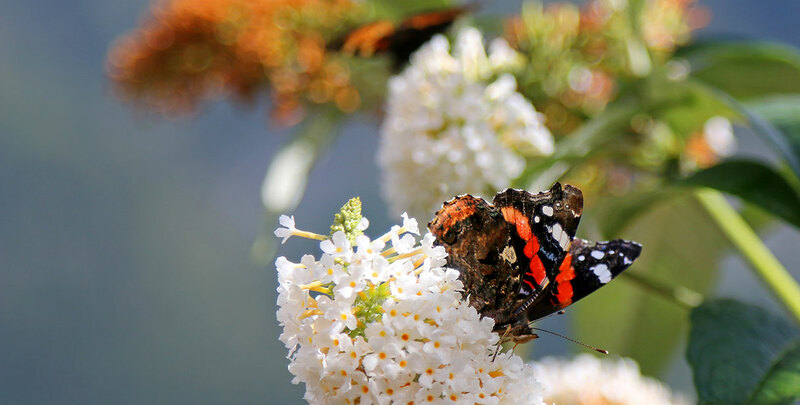 Buddleja ‘White Profusion’ will bloom from July to October, boasting perfumed white flowers with yellow eyes which will coax butterflies, bees and other beneficial insects to your garden – an added benefit sure to please gardening enthusiasts. This butterfly bush can grow between two-and-a-half and four metres in height and will spread to equal dimensions over the course of up to ten years, making it a suitable hedging plant for informal hedges. ‘White Profusion’ is a true eye catcher with its clusters of showy white flowers on elegant arching stems, but despite its delicate looks this buddleja is fully hardy and will continue to offer visual interest to your garden year after year.